A BIG week in the AFL means a HUGE week in DT which means a MASSIVE edition of the Bullets for you! Along with my Makers and Breakers, I take a look at the Shaw Thing, the Captain Drought and all the Lessons I’ve Learnt from DT this season! Let us know what lessons you’ve taken from Dream Team in 2011 in the comments! Big news for the AFL this week, which usually translates into a big week for DT, and this week was no exception. I’ll get back to the AFL news and its ramifications, but for now let’s focus on the scoring for this week. There weren’t many huge scores, and even less from our popular premos, but as our teams are getting better, so are the scores we see each round. And hence the expectations we hold have changed – I was personally very disappointed with my score of 2120, considering the solid scores across the board this week. So I’d say 2300 was a great score this week, and anything less than 2-2 would have left you wanting. Shaw’s shawly shawt on Common Sense? Okay, puns are out of the way… The big news of the week, if you’ve been living under a rock, is Heath Shaw’s 8 week suspension for gambling. I’m not going to go into whether it was right or wrong, too harsh or too soft – I’ll just say it was plain stupid and now he’s off the DT table for 2011. But the most important detail here is that it broke on Friday afternoon! This is a great example about why you DON’T TRADE UNTIL JUST BEFORE LOCKOUT! I’ve heard handfuls of sob stories about trading in Shaw just this week – but unless you really had to (like, you’re at your Mother’s funeral, or your wife is giving birth, etc. ), you’ve got yourself to blame. Just like AFL players have reached new heights of professionalism with their pre-game routine, so too have elite fantasy coaches. It basically involves not trading until just before lockout – got it? As far as replacements for Heath went, most elected to go sideways, with Broughton, Deledio, Goddard and Fisher amongst the most traded in. But plenty went the old downgrade option, despite it being so late in the year, with Talia and Wilkinson also popular Ins. But I feel for @matthewmullaly who admitted on twitter that he traded in Johncock for Shaw – of course, Stiffy went and injured his back, subbed off for 50. Ouch! As you can see, slim pickings. Certainly not what we’ve come to expect from the best of the best. But before we start playing the blame-game, let’s have a think about it. Swan should have had bucket-loads more if he could convert any of the half-a-dozen goal opportunities he had, and Chapman just had an off game as did the whole Cats outfit. Boyd was solid in a loss, and Goddard earned all 109 in a tough game against the Eagles. For those who had him, Thompson was the best of the lot under the Friday Night lights. So if these guys had off games, what about everyone else we could have considered? 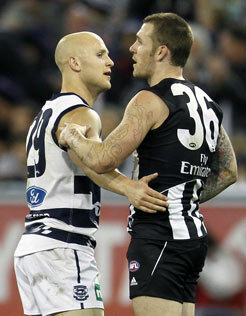 Pendlebury had 123, but not many were brave enough after what Gibbs did to him last time around. Cox had 119, but surely his form was too inconsistent leading in. Bartel had 120 and Rockliff had 117, but these guys were about as popular as Damien Hardwick in a Richmond pub. Even those brave enough to go with Ablett weren’t rewarded for their considerable balls, as he scored identically to Swan with 101. Whoever you put the ‘C’ on, at least feel warmed in the fact that you didn’t put in on Jelwood like I did. 74… I mean, even both his brothers got more than that (83 to Adam and 92 to Scooter)! With a new team, new players, new rules, a new format and the byes; 2011 was always going to be an educational experience. Here’s a few of the things I’ve learnt two-thirds of the way through the season. Long has the homoruckus been considered an out-dated and primitive being – good for a few hit-outs and the odd possession. With a few obvious exceptions, the ruck line has usually been where we have skimped, preferring to play cheap inconsistent ruckmen over expensive, inconsistent and injury prone ruckmen. But the new sub rule has forced them to evolve… and what they’ve become is great for DT! Aside from the classic duo of Cox and Sandilands, and ruck-forward gun Petrie, we have seen the emergence of a few key big men in 2011. Leuenberger has taken the next step, adding an extra 10 points to last year’s average to be going at 87 a game this season. If 10 points is a step, McEvoy has taken a superhuman leap, with his 2011 average of 93.4 dwarfing last years of 58.7! Goldstein is probably the most improved of the lot, coming from nowhere to average 101 this year in McIntosh’s absence! So the biggest thing I’ve learnt this year, is that the game has changed – and the ruckmen are the beneficiaries. I always see these great unique options, especially in the mids, and when they’re in a bit of form I always think, ‘God, wish I had them, could have saved a lot of coin’. But I’ve learnt now that it almost never lasts. Nahas anyone? Jobe Watson? Embley’s and Bolton’s early season form? The only players who have really taken that leap this year are Murphy, Shiels and Fyfe, the latter two both being young guns who will only get better. And while it’s a massive advantage if you pick them, that’s only three out of the whole contingent of non-premiums – not good odds if you ask me. When it comes to your midfield, you need the best. You need your Abletts, your Swans, your Murphys – they are the priciest I know, but it’s for a reason. We all love it when our players smash out those huge scores, but it’s an odd feeling when it’s someone you don’t have. Especially when it’s someone you don’t have, and everyone else does. But there have been a few times this year where coaches have gone chasing these monster scores, only to get burned by the Law of Averages. Exhibition A: Guerra follows up his massive 180 with…. 49. Exhibition B: Steve Johnson puts huge numbers of 171, 143 and 119 consecutively, and is subsequently mass-traded. He’s only averaged 83.2 since, and his price graph looks like a witch’s hat. Exhibit C: Ablett scores 175. Next week, Ablett scores 23. Nuff said. He was 3rd in the Breakers last week, but Petrie has responded and climbed 792-odd places to claim top spot in the Makers for Round 17. Although his 146 was not even a team high (Ziebell had an unexpected 156), he was the most fantasy-relevant player to go big this week. He had 21 kicks, 11 marks and 5 goals in what was a huge turnaround from his paltry 24 just a week ago. There was talk about benching him this week for Zmith or Lobbe, but I hope it was just talk because I do not wish that heartbreak on anyone. Many coaches traded him out on the eve of his bye, but Nick Lower has come back to haunt them! He was everywhere against the Swans (aren’t they supposed to be a lock-down team?) with 30 touches and 8 tackles, which took him to a career-high 130 points. He looked to have peaked just shy of 300k, but with this latest effort he is projected for 325k. Daisy Thomas was best on ground against the Roos last week with just over half a game and he could have earned 3 votes for his game against the Blues, probably fighting it out with Pendles. He was my first option for an Ablett trade last week, and here’s some stats showing why – his latest 135 takes his 3-round average to 124 (4th in the League), and he has scored 7 tons from his last 8 starts! All this, while playing 3rd string to midfield maestros Swan and the aforementioned Pendlebury. Montagna was another, albeit ridiculously cheaper, option for the faux Ablett trade I floated last week. Next thing I know, he collects 17 touches in the first quarter! He finished with 34d, 6m and a goal, and showed he is fit and willing to work for his supper again. If you have a 6th mid spot free but you’re a bit light on change, strongly consider Joey. Broughton’s 114 wasn’t the highest for the round, but it caps a remarkable month which sees the Docker with the highest three-round average in the competition of 134. He also has topped 30 touches three games straight, a career-first. He’s back! Duffield seems to have taken Broughton’s mantle as the biggest underachiever is the Fremantle side. Actually, defenders in general, given Adcock’s encouraging 79 against the Cats. His ordinary 60 last week was succeeded by his 26 against the Swans, prompting his price to plummet another $27,700. Rawlings is another Defender to put in one to forget, with only 43 on Sunday afternoon. He was a popular sideways option when Jack Grimes (remember him?) went down earlier in the year, but has dropped 40k after some initial good form. What to do with Darling? If you’re smart, you would have gotten rid of him near his peak-price of $273,400. But if you’re a tool like myself and you held him for some unknown reason (after some reflection, I decided it was because I didn’t need the cash at the time and didn’t want to use trades willy-nilly), then what? He’s down to a touch over 200k, thanks in most part to a couple of vests and 5-straight scores below 67. Scully was talked about as a possible unique 6th mid after his excellent first two games for 2011. Unfortunately for those who took the plunge, it’s been all downhill from there, with failing to crack the ton in his last 4 culminating in this weekend’s offerings – 50 points and a back injury. It doesn’t look serious, but given his form, now might be the time to cut losses and trade him to a Montagna/Sylvia type. Jolly had an eight-week break prior to round 15 this year, and while he can hardly be expected to be smashing out tons so soon, we definitely thought he’d be able to top 55 given the midfield talent around him. Maxy himself said that Jolly should be back to his best (and he obviously believes it, trading the big man into his own team! ), so hopefully he can drastically improve and cash in on the ruck blitz as his fitness, and therefore TOG, increases. No Port players this week with the Power having the bye, which means we get to take a look at (what should be) our best sides in action in Round 18. Consider this a great dress-rehearsal for the finals and a good opportunity to see whether your team is as complete as you hoped! This is also the 2nd last league match before finals, so trade accordingly – in most cases, with no byes to cover, I suggest you don’t. who should i get in for shaw?. also who should upgrade out of those rookies, and too who? Fisher or Suckling OR both!! Suckling 1st, then maybe Fisher if room!!! Its about time we drop any reference to stopping first posters, its getting really old. Try “126 with 4 premo ruckmen”, or is “Sandi to Lobbe a good trade?”. Cant wait for this weeks port bye, Full strength squads. Spot on! Assistant coach has given me a predicted score of 2408! Great write up as usual, Tbetta. Looking forward to bring back in my beloved Hawks. Also, are Adcock and Sylvia back to form? It’s more what role they play. If Sylvia plays more in the midfield he’ll get more points and if Adcock is used as a rebounding defender rather than a stopper he’ll score more points. Lol homoruckus! Howe (21) was my breaker followed by Gu (61) then everybody else was 79+. Hopefully my team is starting to hit some good form. 2300’s for Luke’s Legends. Highest score in my league which is doing very well overall. Good one Tbetta. My breaker was definitely Rawlings with Lower on the bench. That hurts. And you know if you put Lower on the field this week he will have a stinker. The only change this week is Buddy in for Tippett. As Tippett got 84 Buddy better do big things. We all think that there will be full teams this weekend however Collingwood is playing the Gold Coast. I expect 3 or 4 big DT changes for the pies! I need all Gablett, Swann and Pendles to play. I think Swan is a certainty to play, Gablett 50/50 Gmac might want to rest him coming off the back of a win and a suspected injury. Pendles hasn’t missed a game yet so I think it would be about his time to sit out. I am lacking in trades so I might have to let this game go if any of these guys are rested. After that hit by Warnock the smart money is on Pendles having a break. Swan wont rest he’s just getting back into the swing of things after his 2 weeks off. if anyone is going to get a rest it might be Daisy or Pendles. Maybe even Cloke. If Mick decides to rest Pendles and Thomas, which he should, the race at the top of the ladder for DT legend status becomes very interesting. Dids in for Thomas or Pendles??? gilbert and jack reiwoldt anyone? The worst breakers are the guys you keep for cover that keep letting you down, for every Lower there is a Brodie Smith. My forward back ups are Yarran, Darling and Harper. Dont know why I bother having back ups because they only seem to score for me when they are on the pine. Agreed there is no point We would have been better off with all rookies, I have Jack Reiwoldt as the backup and he does the same thing, scores an 80 on the bench and then when I need to play him he gets 55. With respect to your “Go Premo” section – Rockliff and Redden are notable exceptions. I doubt any coach who has (or had) either of these two in their midfields would be disappointed. Also my own personal tribute to Nick Lower. He was standing in the knackery cart all week scheduled for a Friday evening trade to Heath Shaw. But I was saved due to the AFL announcing Shaw’s suspension prior to DT lockout. I decided to wait another week or so for other premo back targets to fall in price and play Lower this week, particularly since he was named on ball. Outcome – 130 points plus a price rise of $30-$50k. Yay! I have both redden and rockliff and it has helped me smash teams week in week out! They both usually crack 110, but when one has a dud game with 90 the other smashes out 130….good combo as they pick up each others slack! I don’t have either of them (unfortunately) but I have kept my eye on them all year and noticed that exact same thing. Next year, depending on the fixture, I will most likely start with both. They’re only gonna get better! I am just shouting out for all people who have a great dream team on paper yet the team can’t perform on a weekly basis. I got 2265 on the weekend so can’t complain but seriously I think my team looks bloody great on paper yet always underperforms. i think I have everything you need in dt this year. Dpp between def and mid. Dpp x 2 between mid and fwd. My strongest team contains Heppell, Stanley and Didak all on the bench. Surely thats saying i have a pretty decent side. Bit annoyed this week with Stanley and Prestia 93 and 92 on the bench but I know you can’t have everything perfect. On my last note i would like to praise the efforts this week of two of my more uniquer players. Gram finally did something (needs to learn to kick more) and also Jared brennan who was able to pull out 99 despite only getting 13 disposals. What’s your team name champ? Thursday traded Lower to Delideo and Swallow to Monty because I have a social life so I couldn’t get to a computer and my phone has almost no internet. Check after lockout and realize that Heath is out and I have my emergency BJ playing. The moral of the story is social lives hurt DT. It won’t happen again. P.S. Love The Chasers picture. Dustin Martin??? Not sure bout that mate, he is good but not good enough to be a DT premium this year IMO!!! In the context of defenders, I’m guessing Digger was referring to Stefan Martin, who has slipped under the radar and been scoring pretty well in DT this season. Fair call then…….has done well. Anyone else think Beau Waters could be an option to trade in for Shaw if you can wait a week or two? nah mate not worth the risk imo. Waters was great last year and i love him but too risky i think, better off going with suckling or anotother proven DTer. Word out of the Freo camp is that Sandilands will make his return against Coxy this week!!! I hope so, I kept him because he could make the difference come finals. They are saying he is 50/50 which basically means they have no idea if he is ready to play or not. Just like before if they rush him back he will more then likely be gone again. Even if i had him i wouldnt put him on the paddock his first game back that’s for sure. Did you hear about the Australian Post had to recall all their new stamps? They were of Collingwood players and people weren’t sure which side to spit on. Was contemplating the same thing. Mostly because i am playing a weaker side in my league and can afford him to spud it up and not cost me a win lol. had petrie as cpt last week. loved every minute of it. Better option out of Suckling and Fisher? What do you call two Collingwood supporters driving their car off a cliff? A tragedy…at least 5 could fit in the car. As if it was “their” car, not a stolen one. I think that Freo supporters are at least as bad as Collingwood supporters. Only a west coast supporter would say that. I take offence. I’m Freo but i don’t hate west coast and for obvious reasons have not payed them out once this year. Collingwood supporters are a lot worse. The things I’ve learnt from 2011 section is great and I’d love to see an article at some stage on potential make up’s of teams for next year? I’ve got a couple of blokes in my league that I’d love to get a jump on with some good planning and it’s never to early to start planning IMO. You can plan early, however, most people made more than 10 changes from when the system went live to 1st lockout due to the amount of injuries. Just trade heavy and give yourself a chance for the last two games of 2011. Better option – Birchall or Deledio? No more byes, much greater scoring potential..
Callinan pretty much certain to play! I think its ok to trade before Friday night if, for example, you can’t get to a computer on Friday night. hibberd out for just general soreness the weekend passed? thoughts on him hitting the field for the coming week? is he considered part of the best 22 available? As a bomber fan I reckon he’s in the best 22. But I cant pick who will be dropped for Watson let alone who will be dropped for others. Hi All. I know it isnt trade talk – but have a hectic week ahead of me and wont get a lot of time to look in before the weekend. Didak has been pretty bad this year and Fyfe is very consistent but Broughton shows that you should avoid trading premiums. I say go from Swallow to a really good premium. Maybe a Hawthorn midefielder. No posts from TKOK for a while? TKOK. The King Of Kock? Definately going to go petrie as captain again this week. The risk payed off for me last week and playing a 15th ranked tklol I can afford to take another punt on captain choice. I was even considering making didak cpt vs tklol just to give myself a real challenge leading into finals.